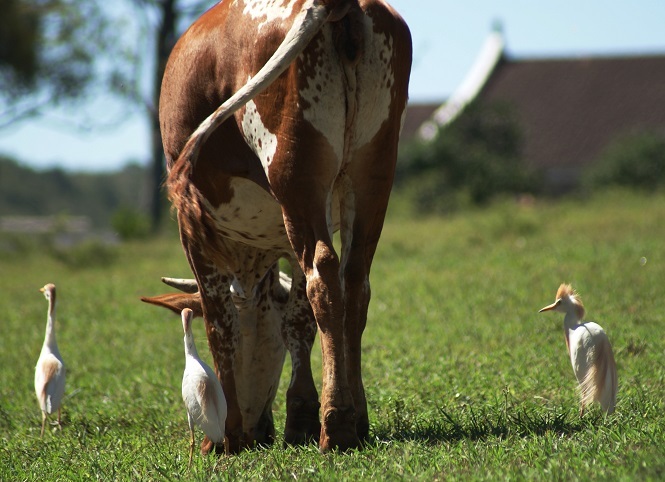 I have mentioned before how Cattle Egrets are frequently seen in the proximity of the Urban Herd, quick to catch any insects disturbed whilst the cattle are grazing. We saw several examples of a similar relationship in the Addo Elephant National Park. 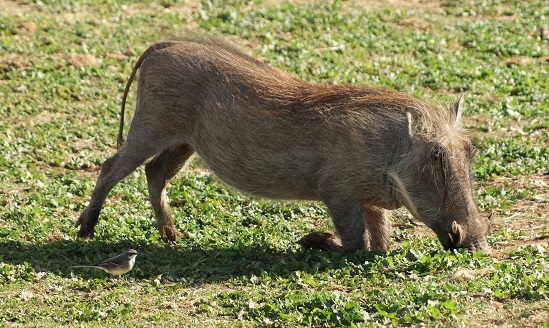 The first was a pair of Fiscal Shrikes hovering around these Warthogs as they scuffled around in the dry grass for food. 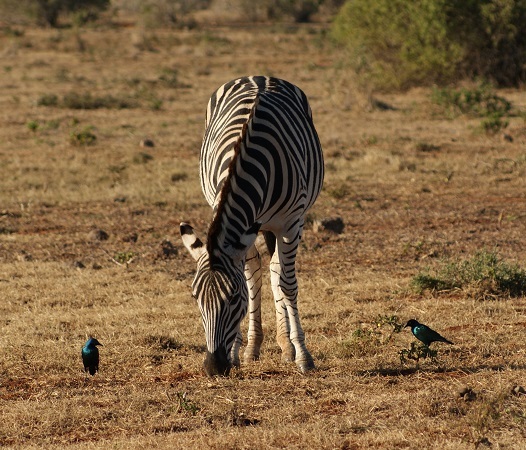 Next up was a pair of Cape Glossy Starlings keeping a close watch for whatever the Zebra may have disturbed while grazing. 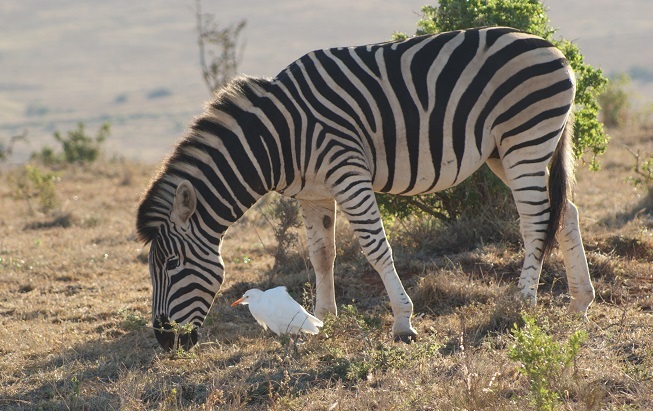 A Cattle Egret found several insects to eat next to this Zebra. 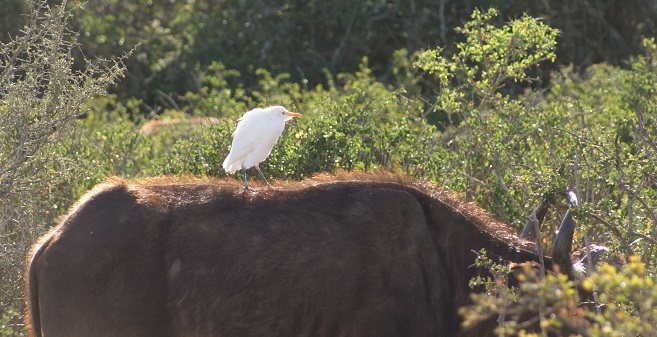 This one hitched a ride on the back of a Cape Buffalo! While this Cape Wagtail had a feast in the company of a Warthog next to the Hapoor Waterhole. This entry was posted in Animals, Birds, Game Reserves and tagged Addo Elephant National Park, Cape Glossy Starling, Cape Wagtail, Cattle Egret, fiscal shrike. Bookmark the permalink. Lovely pics and very informative explanation of the bird and animal relationships! Thanks Anne. Great photographs! This is a very interesting phenomenon. As I think about it, I’m pretty sure something like this happens in the human world. We just don’t think of ourselves as being different species, though sometimes I am tempted to say that the differences are that great–not in terms of race, ethnicity, etc., but simply in the size and “appearance” of spiritual life..